Master Joe didn't always go by "Master Joe". Before he adopted the name "Joe", he went by Xian C. Ou. He chose "Joe" when he first arrived in America, to make it easier on the people he met in his new country. He also didn't always have the title "Sushi Master". Originally, Joe was a doctor working in South East China. Joe enjoyed medicineâ€”especially getting to help people. But he couldn't resist when the opportunity to move to Japan and study under a true sushi master presented itself. He studied for ten long years under a formal sushi program in Japan, spending months on just the very basics of cutting cucumbers before moving onto anything more substantial. After a decade's worth of training, Joe moved to New York. He liked it, and worked in several successful restaurants there. But, once he had a family in tow, he and his wife Karen decided to migrate to a better place to raise children. They visited Fairhope to see some friends once, and fell instantly in love with the quiet charm of the Eastern Shore. 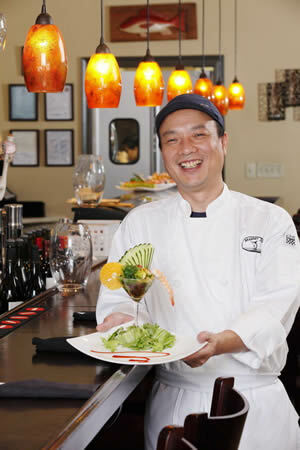 In March of 2009, Joe opened his first restaurant: Master Joe's Sushi. Master Joe's Sushi is an unrivaled jewel of Eastern Shore cuisine. The Sushi at Master Joe's simply outpaces anything available in the area. As soon as Joe opened his doors, Sushi-lovers from all over South Alabama were flocking to his restaurant; and with some regularity. You can't just go once, which is what has made Master Joe's into such a staple of the Fairhope community. Master Joe may have taken a winding road to end up a successful restaurateur and sushi chef in Fairhope, but he is grateful that people of this community have been so welcoming and receptive! With the opening of the new Master Joe's Sushi in Orange Beach, Joe and co-owner Chen Lee plan to bring their innovative sushi and Asian cuisine to the area for locals and vacationers to enjoy.